Checking in to the Lalit Mahal Palace Hotel in Mysore, India. At the Devaraja Fruit and Vegetable Market in Mysore. At the Kumarakom Lake Resort with the Executive Chef of the Hotel after a cooking demonstration. This is a beautiful property and here is where Prince Charles stayed during his recent visit to Kumarakom. At the Devaraja Market in Mysore. At the Maharaja's Palace, Mysore. On the streets of Mysore demonstrating the making of "Paani Puri and Chaats"
At the Kanchi Kailasanathar temple in Kanchipuram, Tamilnadu. In Aleppey, Kerala driving the house boat. In the houseboat in Kerala after the cooking demonstration and lunch. At a cooking demonstration at the Taj West End in Bangalore, India. Inside the Ekambareswar temple in Kanchipuram, Tamilnadu. On the streets of Chennai, India. In a village in Kerala, India. On a coconut tree in Kerala. At a farmer's market in Irinjalakuda, Kerala. At a cooking demonstration at the Taj Vivanta, Trivandrum, Kerala, India. 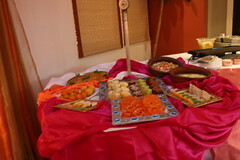 At the Taj Vivanta, Trivandrum after the cooking demonstration. In sweet shop in Calicut, Kerala. At the residence of the famous cooking teacher Nimmy Paul in Kochi, Kerala, India. At the Maharajah's palce in Mysore. This picuture was taken from our houseboat when it was drizzling. A hoseboat ready to dock on the backwaters of Allepey. After breakfast tour Old Delhi with a visit to the Jama Masjid, the royal mosque built by the Mughal Emperor, Shah Jahan in 1656. It is one of the largest and most beautiful mosques in the world and is constructed in red sandstone and white marble. The main prayer hall has a seating capacity of more than 20,000 worshippers. Enjoy a cycle rickshaw ride through the narrow lanes of Chandi Chowk, the spine of Old Delhi. Jahanara Begum, the daughter of Shah Jahan designed this commercial area in 1648. Walk through the by-lanes of the Wedding Street and the Jeweler’s Lane to savor a 350 year old culture up close. The tour culminates at the Spice Market also known as Khari Baoli. This is Asia's largest wholesale spice market. At present, the street is a congested and busy market with shops on both sides selling spices, nuts and herbs. You will enjoy a unique experience watching the process of loading, carrying and unloading of huge sacks of items from manual trolleys, shopkeepers busy dealing with their customers, customers selecting large quantities of items and weary laborers resting and chatting aloud. It all seems to be very chaotic but in reality it is a very well managed market area! After a light lunch drive past the Rashtrapati Bhawan (Presidential Palace) where the Viceroy once lived but is now the official residence of the President of India. Then visit the Qutb Minar, a stunning 240-foot minaret, the tallest in the world, surrounded by an elaborate complex built in the Indo-Islamic architectural tradition. After breakfast drive to Agra via Sikandra the last resting place of the Mughal emperor Akbar. The tomb of Akbar lies here in the centre of the large garden. Akbar started its construction himself but it was completed by his son Jehangir, who significantly modified the original plans which accounts for the somewhat cluttered architectural lines of the tomb. Upon arrival in Agra, check in to the hotel. This evening visit the Taj Mahal at sunset. Often considered the pinnacle of Mughal art in India, the Taj was built by Emperor Shah Jahan for his beloved wife Mumtaz Mahal. When declaring it a world heritage site, UNESCO described it as “the jewel of Muslim art in India”. There are few words that can describe the magnificence of this monument. Marvel as light and colors transform this stunning monument in the beautiful sunset glow. After breakfast, we set out to explore the Agra Fort, the work of Akbar the Great, who built it over the course of eight years (1565-1573). The fort was successively occupied by Emperors Jahangir and Shah Jahan; the latter died here, imprisoned by his son, left to gaze at the Taj Mahal he had built. We cross the Yamuna River to visit Itmad ud Daula. The mausoleum was built by Queen Nur Jahan in 1622 in memory of her father. It is a notable representation of the fine inlaid stonework and translucent marble. Many historians believe that this monument was Shah Jahan’s inspiration for building the Taj and is often described as the “petite Taj.” Continue overland to Jaipur en-route visiting the old deserted town of Fatehpur Sikri the eerily abandoned capital of the Mughal Empire between 1570 and 1586. Akbar built this city to celebrate the birth of his son and future heir to the thrown, Emperor Jahangir. While Akbar is believed to have been illiterate, he took great interest in the arts and architecture; Fatehpur Sikri is one of his masterworks. Sadly, it served as a capital for little more than a decade, eventually abandoned for lack of accessible water. Stop for lunch at Laxmi Vilas Palace previously known as Raghunath Niwas. In 1994 the palace was converted into the now famous Laxmi Vilas Palace. Bharatpur Palaces have played host to such dignitaries as the Duke of Edinburgh, Shah of Iran, King of Nepal and the Shah of Afghan and has been a prime witness to, and a participant in almost every eventful experience that took place in the princely state of Bharatpur, be it royal weddings, affairs of the court or Royal duck shoots. This morning we will drive a short distance outside of the city to Amber Fort and Palace. Perched on a hillside on the outskirts of town, the palace was constructed in the 1590s by Maharaja Man Singh, the commander of Akbar’s army, and was largely motivated by the highly defensible location. This is a beautiful and very well preserved structure, built on four levels and surrounded by ruins, which served as the backdrop for the Mira Nair movie “Kama Sutra: A Tale of Love.” We then return to the city for a look at the grand Hawa Mahal often called the Palace of Winds and a striking landmark. Built in 1799 by Maharaja Sawai Pratap Singh specifically for the women in the royal family, this building allowed them to watch the city’s processions through tiny, latticed windows and balconies without ever being seen. This five-storey pyramidal monument resembles a giant honeycomb and gets its name from the pink wind vanes that are perpetually in motion. This afternoon visit the City Palace and impressive Jantar Mantar, an astronomical observatory built in the early 1700s by Maharaja Jai Sing II, the great warrior-astronomer to which this city owes its name. 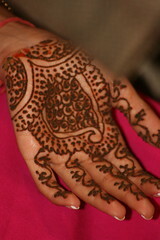 Then learn the art of an Indian tattoo design on your hand by a professional artist. This Heena (Mehendi) design is associated with lots of things; a good dark design is a sign of good luck for a marital couple. It is common for the names of the bride and groom to be hidden in the Mehendi design; and the wedding night cannot commence until the groom has found the names. Some examples of popular traditional images used in Mehendi designs are the peacock, which is the national bird of India, the lotus flower, and an elephant with a raised trunk a symbol of good luck. We begin our day at the City Palace, overlooking the blue waters of Lake Pichola. Maharana Udai Singh initiated construction in 1559 A.D. and it was subsequently expanded, with impressive uniformity, by several succeeding Maharanas. The palace consists of a number of beautiful courtyards and gardens. The main hall has been converted into a museum, housing opulent artifacts and original works of art. Inside the complex we will find the exquisite crystal gallery, exhibiting 19th century pieces including crystal chandeliers, tables, sofas and beds. We will continue walking towards the Jagdish Temple to study its many remarkable friezes. Lavishly built in 1651 by Maharana Jagat Singh, it is easy to understand why Jagdish is the most venerated Hindu temple in Udaipur. Afterwards we will explore the Old City, wandering through its bustling streets lined with art shops, spice vendors, tailors and more. This morning depart for the Gateway of India, the principal landmark in Mumbai, and originally the principal port when visitors came to India by ship. The gateway was conceived, following the visit of King George V to India in 1911, and was officially opened in 1924. Its architecture is akin to the conventional Arc de Triomphe, with elements derived from the Muslim styles of the 16th century Gujarat. Here you will board a motorized boat for the one hour excursion to Elephanta Island (closed on Mondays) a UNESCO World Heritage Site. The island is famous for its great cave shrine, excavated in the sixth century, dating back to the period, when the island was known as Gharapuri, the Fortress City. The cave temple, which is the pride of Elephanta, sprawls over an area of approximately 5000 square meters, is reached by climbing a flight of approximately 100 steps, to the top of a hill. One's attention is immediately drawn to a series of marvellous sculptured panels, nine in all, which are set like tableaux on the walls. The afternoon is at your leisure. Today you will be transferred to the airport to board a flight to Cochin. On arrival in Cochin you will be met and driven overland to Kumarakom the enchanting backwater destination that slumbers on the banks of the famous Vembanad Lake, a part of Kuttanad ('granary' of Kerala). Vembanad Lake with its majestic canals, streams and tributaries along its banks weave an intricate and enchantingly beautiful web. Kumarakom is an unbelievable beautiful paradise!! The blue backwaters and the surface of Vembanad Lake reflect the azure sky. The amazing shades of green of the vegetation that include mangroves, coconut palms, and paddy fields cover the verdant countryside. The gorgeous green of the fringed palms ripple in the blue waters and blend into wavelets. After breakfast drive back to Cochin, the commercial capital of Kerala with its modern part Ernakulam and the old peninsular district of Fort Cochin and Mattancherry, Cochin is situated on the southwest coast of the Indian peninsula. Over the years, Cochin has emerged as the commercial and industrial capital of Kerala and is perhaps the second most important city on the west coast of India (after Mumbai/Bombay). Cochin was an important spice-trading center on the Arabian Sea coast from the 14th century onwards. It was the first European colonial settlement in India. First the Portuguese followed by the Dutch and the British ruled here until the 19th century. Visit the Jewish Synagogue (closed on Fridays & Saturdays) built in 1568. Scrolls of the Old Testament and a number of copper plates inscribed in Hebrew script are preserved here. The building was destroyed by the Portuguese in 1662 and rebuilt by the Dutch two years later. Then visit St. Francis Church, the oldest church constructed by the Europeans in India. Built by the Portuguese in 1510; it housed the remains of Vasco da Gama for 14 years before it was transferred to Lisbon. His tombstone can be seen inside the church. Also visit Mattancherry Palace built by the Portuguese in 1555. The Palace was presented to the Raja of Cochin as a gesture of goodwill. The palace was known as the Dutch Palace, resulting from substantial renovation by the Dutch after 1663. The central hall was the Coronation Hall of the Rajas. Their dresses, turbans and palanquins and murals from Hindu mythology are all beautiful and worth seeing. After touring you will be transferred to Cochin International Airport for your onward flight. What are you waiting for? Book now and avoid disappointment. It is usually a small group and it get filled up quickly. So, what are you waiting for? Book early and avoid disappointment. It is usually a small group and it gets filled quickly. 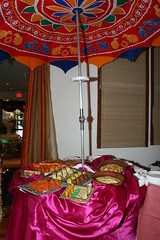 Indique Heights Restaurant is bringing the Indian Festival of Lights to Washington, D.C for the sixth year. 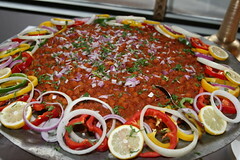 On October 16th, 2011, neighbors, families and friends are invited to stop by Indique Height’s expansive outdoor terrace for festivities including Indian street snacks, and cultural activities for the entire family. Diwali festival symbolizes the triumph of good over evil. Lights and diyas (oil lamps) are lit signifying the driving away of darkness and ignorance. Though there are many legends and religious attributes attached to the festival, the Diwali celebration is a time for togetherness with family and friends. The festival at Indique Heights will transform the expansive terrace into a festive bazaar including a Diwali feast, henna artists, women fashions, jewelry, and paintings by a local artist. 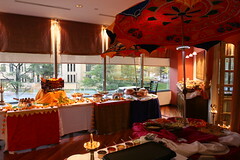 Guests can feast on a great menu of Indian street snacks and cuisine, and partake in a host of cultural activities. 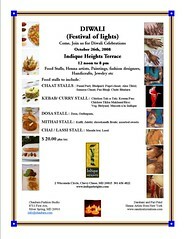 The Indique Heights Diwali festival is on October 16th from 12 to 7.00 pm on Indique Heights’ terrace at Two Wisconsin Circle in Chevy Chase. Admission is $21.20 per person. Children (ages 4-10) - $12.72. Here are some picturs from the previous years. The annual DC Central Kitchen's "Food Fight" was a grand success. The Ronald Reagan Building atrium was packed to capacity with foodies, restaurateurs, media, celebrity chefs and supporters of the DC Central Kitchen. Congratulations to Chef Michael Mina for winning the Championship.Red skin's Mark Kessler.Chef Jose Andres and Chef Anthony Bourdain were the master of cermonies. 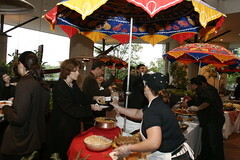 About 60 of Washington's top restaurants participated in the event. The contestants in the food fight were chef Mike Isabella, Chef Bryan Voltaggio, Chef Tracy O Grady, Chef Baron Seaver and Chef Michael Mina. The judges were Ted Allen ( food tv), Chef Eric Rippert, Chef Carla Hall, Chef Rock Harper. Indique and Indique Heights restaurants were once again proud to participate in this annual event. Heartiest Congratulations to all the participants, the restaurants, sponsors and those folks at DCCK who work tirelessly day in and day out to run this great institution.Cheers! Here are some photos which I managed to click during the event. .
Indique Heights Restaurant is bringing the Indian Festival of lights to Washinton DC on Otober 26th. Neighbors, Families and Friends are invited to stop by Indique Height's expansive outdoor terrace for festivities. are lit signifying the driving away of darkness and ignorance. Though there are many legends and religious attributes to the festival, the Diwali/Deepavali celebration is a time of family gatherings, great food and celebrations. The festival at Indique heights will transform the expansive terrace into a festive bazaar including a diwali feast,henna artists, music, jewelry vendors. 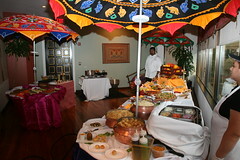 Guests can feast on a great menu of Indian street snacks and cuisine. The Indique Heights Diwali festival is on October 26th from 12 to 8 pm on Indique Heights terrace at two Wisconsin Circle, Chevy Chase.